In May 2018, the International Coffee Organisation (ICO) composite indicator increased by 0.7%, to an average of 113.34 US cents/lb, following three months of declines. Prices for all coffee groups rose in May 2018, though the largest month-on-month increase occurred for Other Milds, which grew by 0.9% to 135.61 US cents/lb. Global coffee exports amounted to 10.18 million bags in April 2018, compared with 9.50 million in April 2017, driven by an increase of 14.1% for Robusta shipments and 6.8% for Colombian Milds. World production in 2017-18 is estimated 1.2% higher at 159.66 million bags with output expected to grow in eight of the ten largest coffee-producing countries. After falling in each of the last three months, the monthly average of the ICO composite indicator rose by 0.7% to 113.34 US cents/lb in May 2018. The daily composite indicator ranged between 116.88 US cents/lb at the start of the month and 110.61 US cents/lb on 15 May before ending the month at 114.90 US cents/lb. While the monthly average is slightly higher than last month, it is the lowest average monthly price for May since 2007 when the ICO composite indicator reached 100.09 US cents/lb. From 142.33 US cents/lb, ranging between 119.91 US cents/lb in May 2016 and 227.97 US cents/lb in May 2011. Despite the relative balance between supply and demand in the coffee market for coffee year 2017-18, the large crop anticipated in the coming months seems to be factored into current market prices, which are lower than the fundamentals would suggest. However, the increase in May’s prices compared to last month suggests that further downward movement is limited. Prices for all group indicators rose in May 2018. The largest increase occurred in the average price for Other Milds, which grew by 0.9%, to 135.61 US cents/lb while Colombian Milds increased by 0.7% to 140.26 US cents/lb. As a result, the differential between Colombia Milds and Other Milds decreased by 6.1% to an average of 4.65 US cents/lb. Similar to the composite indicator, the May 2018 average price for Other Milds and Colombian Milds are the lowest since May 2007. Brazilian Naturals increased by 0.7%, to 119.57 US cents/lb in May 2018, which is the lowest average for May since 2009. 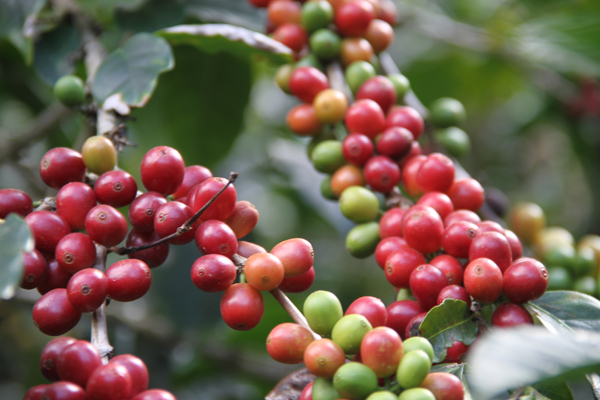 The monthly average Robusta price increased by 0.5%, to 88.74 US cents/lb, which is above the averages for the same month in six of the last ten years. The average arbitrage in May, as measured on the New York and London futures markets, rose by 4.5%, to 42.65 US cents/lb. Additionally, intra-day volatility of the ICO composite indicator price increased by 0.8 percentage points to 4.8%. World production in 2017-18 is estimated at 159.66 million bags, 1.2% greater than last year. Arabica output is expected to decline by 4.6%, to 97.43 million bags while Robusta production is predicted to grow by 12.1%, to 62.24 million bags. Production is expected to grow in all regions except South America, which is estimated 6.1% lower at 70.59 million bags. Output from Africa is estimated to rise by 3.2%, to 17.66 million bags, from Asia and Oceania by 10%, to 49.49 million bags, and from Mexico and Central America, by 7.1%, to 21.92 million bags. Production is expected to grow in eight of the ten largest coffee-producing countries. Total exports in April 2018 grew by 7.1%, to 10.18 million bags compared to April 2017. Robusta exports saw an increase of 14.1%, while shipments of Colombian Milds grew by 6.8%. Total exports for October 2017 through April 2018 were 1.2% higher than those for the same period one year ago. While shipments of Colombian Milds were higher in April 2018, total shipments from October 2017 to April 2018 were down 8.7% at 8.37 million bags. Exports of Brazilian Naturals reached 20.83 million bags, which is 1% lower than in October 2016 to April 2017. However, Other Milds and Robusta exports both increased in the first seven months of coffee year 2017-18 by 6.8% and 3.6%, respectively. As presented below, shipments from three of the ten largest coffee producers declined during the first seven months of the coffee year compared with one year ago. Brazil, the world’s largest producer and exporter of coffee, increased its shipments of coffee by 4% in April 2018 compared to April 2017. However, its exports in the first seven months of coffee year 2017-18 are 5.7% lower than one year ago, as it was an off-year of the biennial production cycle for Arabica. This is attributed to a smaller total crop in 2017-18, estimated 7.3% lower than 2016-17 at 51 million bags. Increasing domestic consumption may also be contributing to the lower export volumes. However, harvesting of its 2018-19 crop is underway with a larger crop expected given that Arabica production will be in an on-year and weather has generally been beneficial. Colombia’s exports in April 2018 increased 3%, to 0.9 million bags compared to the same month one year ago, and its total shipments in the first seven months of coffee year 2017-18 declined by 9.2%, to 7.62 million bags. Its output in 2017-18 is estimated 4.3% lower at 14 million bags due to excessive rain and cloudiness. The smaller crop and strengthening of the Colombian peso against the US dollar have led to the lower volume of exports in this coffee year. Honduras’s exports increased in the first seven months of coffee year 2017-18 by 5.7%, to 4.15 million bags. However, slowing demand has led to a decline in April exports, which reached 804,573 bags. This is 13.9% lower than the same month one year ago and 6.1% lower than in March 2018. The overall increase in exports is due to the larger crop in 2017-18, which is estimated 12% higher at 8.35 million bags in 2017-18. Vigilance against coffee leaf rust and new areas coming into production have contributed to this growth. In the first seven months of coffee year 2017-18, India’s exports increased by 15.6%, to 4.02 million bags. As domestic consumption remains small, much of the coffee produced in India is exported. In 2017-18, India’s output is estimated 12.3% higher at 5.84 million bags, though less rainfall and excessive heat may keep the crop from reaching its full potential. Compared to one year ago when shipments were relatively high, Indonesia’s exports declined by 23.4% to 454,328 bags in April 2018, which is similar to the decrease of 23.7% to 3.54 million bags for the first seven months of coffee year 2017-18. Indonesia currently has limited availability of coffee for export as it has just started harvesting of a new crop and domestic consumption has steadily grown in the last few seasons. Its production is estimated to recover by 4.4%, to 12 million bags in 2017-18 after declining 6.7% in 2016-17. Shipments from Uganda have declined for the third consecutive month in April 2018, reaching 295,184 bags and are 9.3% lower than in April 2017 due to heavy rains that have hampered harvesting in the recent months. However, total exports for October 2017 through April 2018 have reached 2.69 million bags, 4.1% higher than last year as a result of a larger crop in 2017-18, which is estimated to increase by 2.8%, to 5.1 million bags in 2017-18. Planting of improved varieties, more efficient supply of farm inputs, and better agricultural extension services have contributed to the improved yields and increase in output. Peru’s exports for October 2017 through April 2018 increased by 3.5%, to 2.18 million bags, while its production is estimated 1.8% higher at 4.3 million bags as it continues to recover from an outbreak of coffee leaf rust. Ethiopia’s exports for the first seven months of coffee year 2017-18 increased 19.6%, to 1.86 million bags while its output in 2017-18 is provisionally estimated 4.8% higher at 7.65 million bags due to timely rainfall. Mexico has slowly been recovering from the devastation of an outbreak of coffee leaf rust with government policies aimed at recovering production, such as planting new rust resistant varieties and financial packages for planting new trees and accessing technological assistance and training. Its output is provisionally estimated 5.8% higher at 4 million bags in 2017-18. Mexico’s exports in the first seven months increased by 19.7% compared with the same period one year ago, reaching 1.72 million bags.